liquid, which has numerous uses as an admixture, primer, bonding agent and sealer. Sbr Bond is a white Polymer Emulsions used extensively over the last 20 years by the building industry as an admixture for cement and concrete applications, including repair and renovation, surfacing of floors and bonding generally. SBR contains anti-foam to control the density of cementitous mixes. Mixes may be applied in much thinner sections. Excellent resistance to water and water vapour. Aids in the adhesion of self-levelling compounds to the base surface. Gives A high level of resistance to salt permeation. Much improved toughness and flexibility. Reduced surface dusting of concrete. Greatly improved resistance to many chemicals. ideal for use in dairy parlours etc. Reduced water: cement ratio for equivalent workability. Admixture for mortar, screeds, renders. Bonding agent for screeds, renders, self-Levellers. Primer and sealer in tiling applications. Flexibliser for cementicious based tile adhesive when tiling on wooden, asphalt floors. 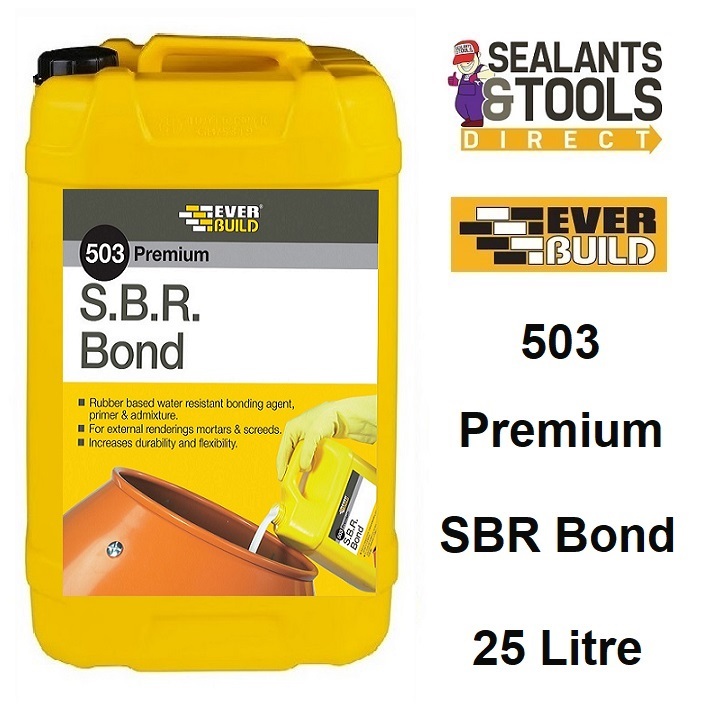 In addition, SBR Bond has the advantage over PVA bonding aids in that it's not adversely affected in wet conditions and is therefore recommended for exterior use. For more information on how to use, where to use and coverage."